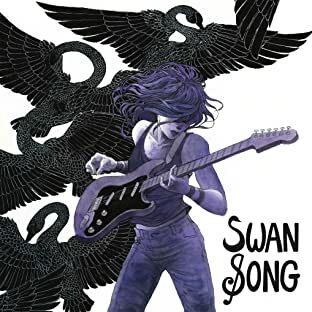 Swan Song is a massive, 184 page anthology of comics about music and life and changing the world. We've got over 20 cartoonists from British Columbia and beyond working on full-colour stories to make you smile, cry, or get up and dance. The anthology features 30+ different creators from British Columbia, the Pacific Northwest, and abroad -- Anthony Biondi, Sam Keating, James Brandi, Hannah Myers, Oliver McTavish-Wisden, Anat Rabkin, Monica Disher, Bevan Thomas, Reetta Lindjama, Simon Roy, Jess Pollard, Jason Wilkins, Jeri Weaver, Jonathon Dalton, Angela Melick, Klara Woldenga, Ed Appleby, K. Kelsay, Riley Masters, Takiko Masters, Yashaswi Kesanakurthy, Annalise Jensen, Adren Belfry, Kaja Belfry Munroe, Drew Gilmour G. C. Seiler, Jesse Davidge, Emily Cowan, Karen Shangguan, Sfe R Monster, Jeffrey Ellis, and Rennee Nault.